Using YouTube to reach your Fan’s can be a tricky proposition. Done right, and you can create something that your audience will remember for a long time after, and will want to share with their friends. Videos have the potential to really go viral. But how long should a video be? Make it too long, and people will be yawning and looking for something more interesting to occupy their time. Make it too short, and you might risk your content being easily forgettable and your message undelivered. 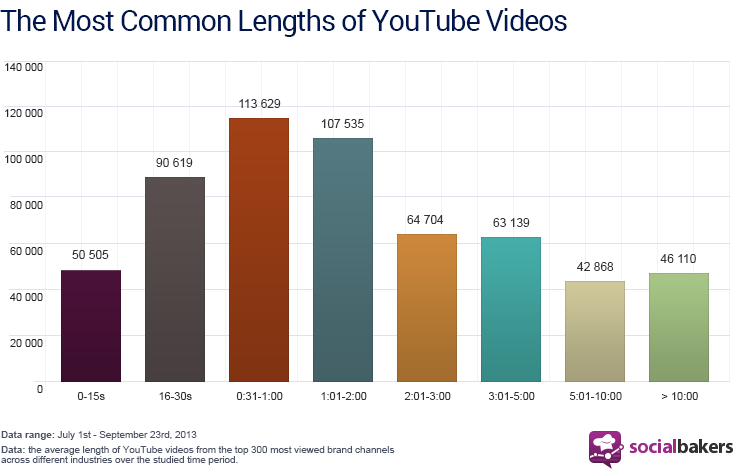 We did some data investigation to get to the bottom of what video length, on YouTube, will makes the biggest impact. To do this, we looked at the 300 most viewed channels among different industries. The first thing we noticed is that videos between 16 seconds to 120 seconds generate almost 50% of all views on YouTube. 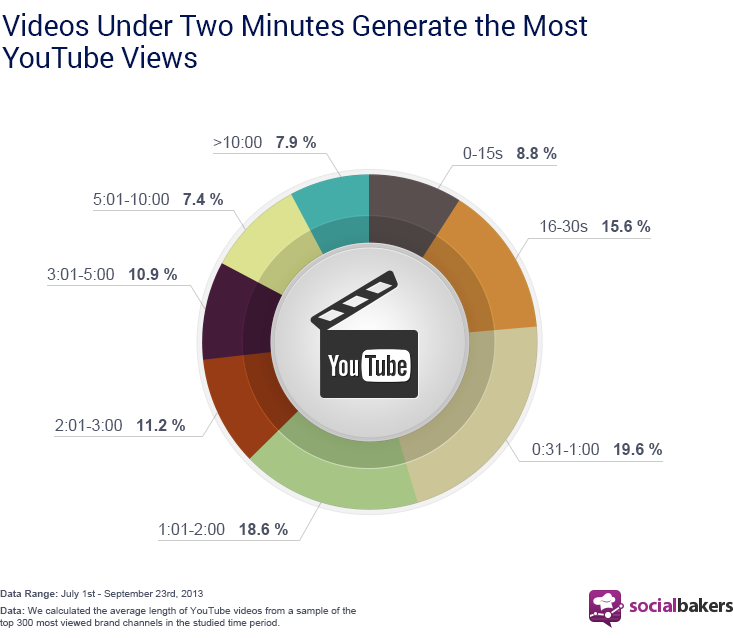 The most successful videos are almost unanimously below 2 minutes in length. With videos longer than that, the number of views often drops off a cliff. These short YouTube videos correspond to an overall trend for shorter and shorter content across all forms of video sharing. If you look at the recent rise of Vine and Instagram videos, you see services that are built around very quick 6-second bursts of content. With more and more things on the web trying to grab our attention, we are overloaded with content. These days, it is often far more effective to take up a small amount of viewing bandwidth in order to keep your audience entertained. However, sometimes a longer video is the only thing that will do for some industries and brands. For example, we found that for the game industry, videos between 3:00 – 5:00 are quite popular for video game trailers, with the idea of creating more engaging and richer stories around the product. In the end, it depends on what you want to sell and tell–both the product and the type of story or message around it. But, if you want to make sure your audience is still watching to the end and not flipping to the new browser tab, you usually can’t go wrong by making sure your video is short and sweet. Get Your Deep Analysis Now! Want deeper analysis into your brand’s YouTube metrics? Try a free trial of our Analytics, and gain powerful insights into your performance!